This afternoon I dropped in on my club's "Stuff, Sew and Sip" afternoon. For the readers who are not Australian (like you - one reader in Poland) let me explain. So let's have a look at this deeply useful product. You can see it is a u-shaped cushion that is worn under the arm. The cushion keeps the arm slightly elevated, away from any surgery wounds, without one having to constantly hold one's arm in the air. Women who use them also report they are great when sleeping. Now this is how we make them. First of all the cushion shape is cut and generous and skilled club members, who are the proud owners of sewing machines, sew up the cushion shapes, ready for stuffing. 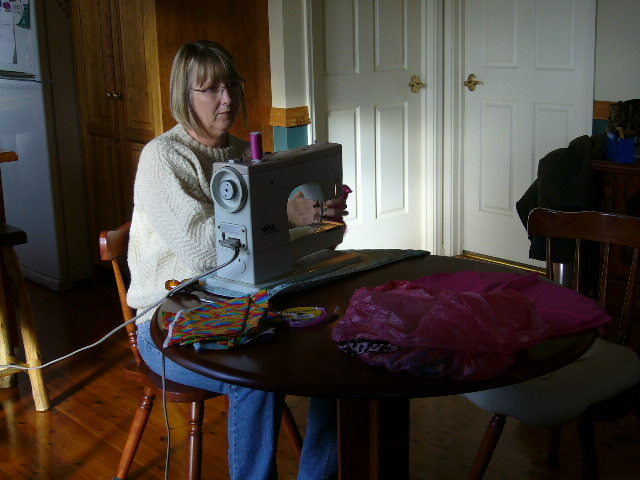 Then the ladies with better eyesight and sewing skills than I, hand sew closed that hole in the base. And finally wrap the finished the product in cellophane and bundle up for delivery to the hospital. 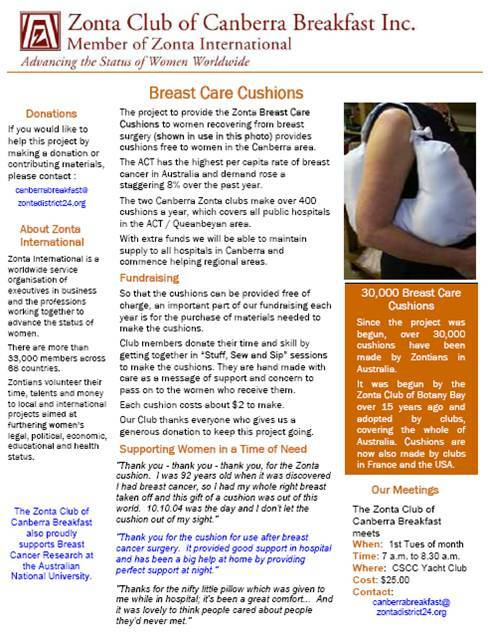 Our club, combined with the Zonta Club of Canberra, makes around 400 cushions per year to ensure that everyone in Canberra who needs a cushion gets a cushion. We get plenty of notes from women who have been recipients of a cushion and they frequently tell of how comfortable and necessary the cushion has been. We have included a couple of such notes on our club cushion flyer. There is no doubt that this project is a winner. All the resources go straight into the cushion and cushions go straight to the woman when she needs it. 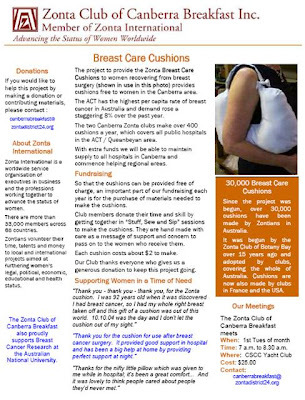 Is this a project your Zonta Club could do? I'm going to see our Patron Saint!